The aim of this document is to discuss the design of a Menus system for a new site and to introduce Modules. Menus and Menu Items are used to create the main navigational links on the pages of the web site. They are not part of the content heirachy in the background. The Menus are themselves a hierachy and there can be confusions between the underlying content organisation of Sections/Categories/Articles and the hierachy of the Menus. Sometimes the Menus reflect the Sections and Categories closely. On other sites the Menus do not exactly match the content structure, so a bit of care is needed here to think about the right things. Menus are used for site navigation and are not part of the content heirachy. For example, the menus on the sample site are placed to the left of the main content and give a viewer a means of finding information. Menu items are grouped under the Menus and are displayed on the site page. Some sites use a few main menus and a lot of menu items. Others, such as the sample site, group things under menus and make less use of Menu Items used as sub-menus. This is a matter of style and taste; both work. The Menus normally reflect the content structure, although there may be occasions when they do not. The key is to avoid muddling Categories and Menus. The Sample data is not helpful here as the list of Menu Items under the Main Menu is the same as the list of Categories. You will find sites where there are Menus that do not relate to a Category. Joomla! adds the Main menu to your site automatically. It already contains a Section for the Front page, so the Main Menu displays the Home page. Some sites stick to the Main Menu and add a heirachy of Menu Items (as sub-menus) beneath the Main Menu. Other sites use more menus, for example the Sample site uses 6 Menus, each with a few Menu Items (or sub-menus) under them. The Menu Manager allows the creation and editing of menus. The Menu Item Management page from the Sample site. Default means that the marked menu is the Front page of the site. Note that the position and layouts of Menus can be very varied and is controlled by the Templates controlling the deisgn of the whole web site. This section deals with the structure of the Menus. Their appearance is dealt with in the part about the appearance of the whole web site. This is worth knowing about before you think about what sort of menus to have on a new site because different layouts can be exploited to make the content more approachable and attractive. There are built-in layouts in Joomla! that take advantage of the organization of content in Sections and Categories. These make it possible to list articles that belong to Sections or Categories. When a new article is created and assigned to a Section and Category, it is automatically placed under a menu. This can give a very good layout for relatively short articles that can be viewed on the same page. News items are often done like this. The Home page on the Sample web site is in Blog layout. Here there is an introductory article across the page and the rest are in two columns. At the end - there is an area for links to older articles that are not listed on the page. There is useful further help about Category Blog Layout under Help clicked in the Menu Item [New] screen. Category List layout Here the articles are listed with a link. So longer articles can be displayed in this way. It is useful for accumulating a series of reports or contributions on a sinlge subject and avoids a plethora of single menu items with single articles. Sometimes there are a lot of articles for one menu - others have only a few. the list handles this well. When you add a new Article to a Section or Category (depending on which one you have chosen), it will automatically show on the page so you do not have to do anything other than add the Article and assign it to the appropriate Section or Category. This also means that you can create Categories specifically for displaying in List or Blog mode. Decide on the Menu items you want at the Top level. It is important to give them sensible and meaningful names. Decide what sort of menu item it can be (will it be a Blog or a List or an Article for example). Decide on any other menu items below the main items. Again they should have sensible names to indicate what is there. Menu items can also be created underneath sub-menus; whether you want to do this depends on the site. You can have quite deep structures, but users find two layers easiest to use to find things. It is not difficult to alter the Menus after the site is established so this list can be seen as a starting point. No-one gets it right first time. Write them down and indicate what sort of Menu, for this will be needed when you create them. Use names that makes sense to anyone visiting the site - an obvious point - but not always done. In this example (to be further explored in creating a new web site) the Main Menu acts as the Top level with Menu Items created beneath it. And further items created beneath the item About the Club to give two levels of menu. Modules can seem a bit of a puzzle because you do not actually see them; you just see the effect they have. 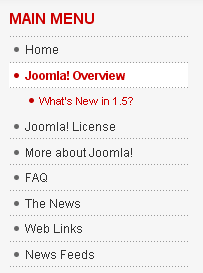 Modules are associated with the menus because Joomla! uses Modules to display content on areas of the page other than the main content area. The menus are thus displayed on particular locations on a web page through the positioing of the menu modules. However, for design and set up of a Joomla! site using the default settings from the installation, there is not much need to consider the finer points of modules. You do, however, need to appreciate that there are a number of Site Modules that can be added to enhance the functionality of the web site. To do this - use the Module Manager in the Administrator Back-end. Module Manager Help is good. Site Modules are pre-defined Modules that ship with Joomla! and are added to a site as part of the development process. A breadcrumb trail is a position marker which shows users where they are in the site and provides a means of navigation up to higher levels in the heirachy. This provides the Login form to allow users to login into the site. Here there are several Site Modules installed. The only one that comes pre-installed is Main Menu. Menu Modules are closely tied to the menu system because each Menu has its own Module. These are created automatically by the system when a new Menu is created. For example, the default in the sample data is that the main menu is assigned to the left of the page.